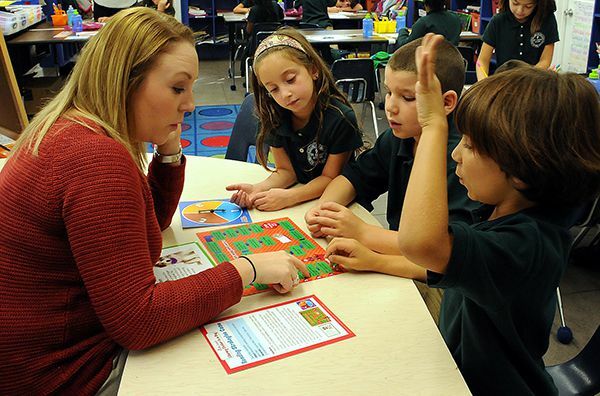 Ivy League’s second grade teachers work to strengthen beginning skills and build students’ sense of self as a learner. As these young achievers grow more independent, reading, writing and mathematics become tools for acquiring information, generating original ideas, conducting simple research and engaging in problem solving. At this juncture, it is extremely important for our teachers to spend time to identify gaps in a student’s foundational and thinking skills and provide appropriate tasks to correct misconceptions. Teachers are also able to help students develop organizational and study skills necessary for becoming a more proficient student. Although essential components of each subject area are described separately here, it is important to note that classroom learning in the second grade often takes place through theme based approaches which integrate many subjects as students begin to make connections between what they learn in class and the larger world around them. They are more willing to take account the perspective of others in social situations. At Ivy League, we believe that strong communication skills are key to accessing knowledge in all other subject areas. In second grade, reading becomes an emerging portal to the world. Through daily guided reading lessons, students continue to expand and develop functional reading strategies, applying them to topics covered in social studies, science and mathematics. Children’s vocabularies increase exponentially through content area reading, and by exposure to additional genre studies. They read realistic fiction, biography, fables, fairy tales, and myths, with comprehension as a main goal. Using more difficult texts and chapter books, students learn to identify main idea, retell in a sequential manner, recognize fact from opinion, and determine cause and effect. Word study is a mainstay of the second grade literacy program. It is an approach to vocabulary instruction, spelling, and by extension, grammar, which researchers have identified as being most successful in providing students with a fuller, richer word knowledge and increased reading comprehension. Words are examined both in and out of context. In word study, reading and writing are closely linked. Students learn how authors use adjectives and adverbs to make their writing more thoughtful and interesting. Informational reading selections require students to use thinking processes different from those used for fiction. Students are taught how informational texts are organized and learn to utilize text aids such as table of contents, glossaries and indices to locate information or clarify word meaning. In second grade, reading progress is assessed regularly and scaffolded according to the instructional level of the learner. In second grade, Ivy League continues to use Writer’s Workshop and the 6+1 Traits of Writing frameworks for teaching and assessing students writing. Building on second graders’ fascination with words, students explore the basic elements of poetry through listening, writing, and speaking. Throughout the year, they experiment with patterns and rhyme characteristics of distinct poetry forms, such as haiku, cinquains and couplets. Ideas, words choices and presentation are three elements of writing addressed in second grade. As with all aspects of the writing process, children learn writing conventions by working with the teacher to revise and edit their own work. They learn to write grammatically correct, complex sentences using subject, predicate and conjunction, and become more adept at inserting correct punctuation. “Handwriting is the vehicle for carrying information on its way to destination. If it is illegible, the journey may not be complete.” As children’s fine motor skills and hand-eye coordination develop, their handwriting improves. The teacher encourages children to form letters correctly, observe margins and work neatly. Writing mechanics and content are evaluated separately, so as not to discourage thought and creativity. Our program is based on scientific research on ways that children learn mathematics, as well as classroom based evidence. Although the program content correlates with New York State standards and follows the National Council of Teachers of Mathematics recommended content emphasis for second grade, we find that most Ivy League students are capable of going well beyond these expectations. Math concepts are presented in ways that children are drawn to - visually and interactively, thus engaging both sides of the brain. A wide range of effective and engaging online tools are available to teachers. Each lesson includes the integration of concept development and computational problem solving. A daily spiral reviews previous lessons and a challenging word problem of the day. Math center activities with guided practice provide for differentiation among learners. Sufficient instructional strategies and resources allow teachers to identify errors and misconceptions in student learning along with their underlying reasons. Students who demonstrate advanced math skills based on assessments and teacher evaluation are given accelerated work. The teaching of social studies in our second grade is carried forward concretely through a series of projects which invite students to think about events and issues from the past and present. Acquiring background knowledge about our nation’s history, geography, government, culture and economic system through reading and research combined with experiential learning, helps the student to appreciate key social studies concepts and to present information in appealing ways. Students are introduced to the fundamental principles of American democracy as expressed in the Declaration of Independence and the Constitution and how these documents form the basis for governing our communities. Field trips enhance students’ understandings of the basic function of government through real life models. The study of geography is both broad and in-depth. Students examine how rural, suburban, and city communities have changed over time. They begin to understand and give examples of how location influences our economy, lifestyle, and attitudes toward the environment. SMART Board® technology continues to revolutionize classroom teaching at Ivy League. It makes it possible for the teacher to present content rich, dynamic lessons. Its connectivity to the internet gives students access to places and events, both locally and around the world. To spark their imaginations and curiosity, Ivy League’s second graders are given the opportunity to plan and conduct simple investigations with the help of our dedicated science teacher. Using controlled experiments, they examine properties of matter and the differences between physical and chemical change. They observe by using their senses and measure with tools of science to tell how things are alike and different. They make models and drawings to share ideas with others as well as draw inferences using what is known and postulate what is not. They investigate by making a plan and carrying it out, and they draw conclusions using what was observed to explain what will now happen. As students explore, reflect, and apply these strategies, they will begin to acquire and internalize scientific attitudes and habits of mind which are the underpinnings of the scientific method of inquiry. In second grade, science units are often interwoven with other subject areas as students study the various topographies of the world and its ecosystems. Students contrast geologically different regions of the world including the Artic and rainforest. Together, the Earth Science and Life Science studies help students gain an appreciation of the delicate balance in nature, raise consciousness about the importance of conversation and preservation of the Earth’s resources and heighten students’ awareness of the natural beauty of our world.